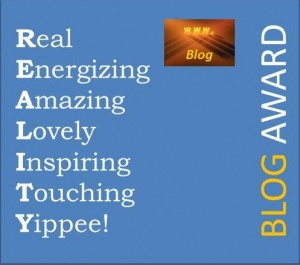 Sagedoyle nominated this blog for the Reality Blog Award! Honestly, I’ve always wondered how it would feel to get one of these awards that are doing the rounds in the world of blogs. What would I say? Will I proudly display it up in the side bar? Who would I nominate? Will this increase the traffic to my blog? Will my mind run around squealing in excitement? The answer in reality was to sit gobsmacked while my mind sputtered into silence before going all nervous on me. In fact, I totally forgot to congratulate Sage on his award as I stumbled all over my typed out comment thanking him for the award. Hmm…..
1. Congratulations Sage for being nominated for the award ! Though I have just started following your blog, your writing intrigues me and I find it very enjoyable to read! 2. This nomination has introduced me to a few awesome blogs that I’m now following! If that is one of the objectives of these awards, then I’m glad because it does give us an opportunity to visit blogs that we wouldn’t have come across otherwise! I need to answer some questions and then proceed with the nomination…so I’ll just get started before I ramble off into oblivion..hehe. Hmmm…well I’m a female so…I’m going to say…my weight! Give me my magic pill! Where art thou, my magic pill? On a more serious note though, I am in the process of changing me, which isn’t a bad thing. Because isn’t this what life is about? To explore ourselves, to learn about ourselves, to acknowledge, to embrace and to evolve moving closer to our true form of light and love? I’m not going to list it all down because that list, I have a feeling is just as fluid as our lives. So what I will do instead is to tell you in one sentence what I am currently working on: To stop fearing my experiences and to learn to let go of control. Hmm..well, I used to always wonder how it would be like to be at the age when I was at school. College. 18 years old. Maybe choose a different path instead of the tried and true path of the elder Ceylonese daughter from a “good family” path? BUT then again…maybe not! Because at this very moment, I am perfect. My past, what it was made for me, to create me at this very moment and this moment is perfect 🙂 As it is with each and every one of us! Insects!!! I have a ready list too that I rattle off by heart. It starts with cockroaches (whimper) and ends with butterflies (shudder). a. Making this blog an avenue for me to help inspire others while sharing my thoughts about life and such. b. To continue to create while exploring my artistic side. c. To make friends with my intuition again and channel it through Tarot cards to help people. Most importantly I would like to open my heart, let go of my fear , learn to trust my life experience and reach a point where I am completely at ease with not knowing. 2. Deb Adams Art : I just started following Deb’s blog and she has absolutely Lovely art pieces up! Inspiration to me, Amazing art! 3. bottledworder : Another blog for Inspiration. I’ve read a lot of other awesome blogs on writing, but for some reason this is one does resonate with me. It’s Real too! 4. 1weekatatime : Another blog that I have *just* started to follow. Her name is Cathi and her blog is Real, Inspirational and talks about how she is coping having her hubby off some where out there deployed in the US Army. 5. Diane Henders : She’s FUNNY!! She’s an author. She thinks she’s a sociopath (teehee) and she’s Lovely! Good morning, Shree, and congratulation! Hey, you started another blog and I didn’t even know. Now I have to get caught up. I already peeked at your artwork – love it! You’re most welcome 🙂 and thank you! Congratulations, Shree… and thank you!